To construct a triangle when two of its angles and the included side are given, let’s follow the examples. 1. Draw a ∆ LMN in which ∠M = 50° and N = 60° and side MN = 5 cm. (i) Draw a line segment MN = 5 cm. 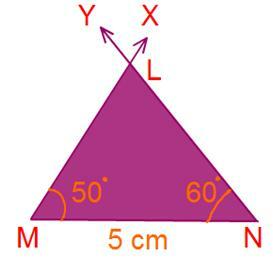 (iv) Let XM and YN intersect at L.
Then ∆ LMN is the required triangle. 2. 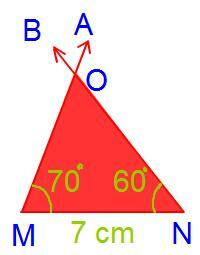 Draw a ∆ MNO in which ∠M = 70° and N = 60° and side MN = 7 cm. (i) Draw a line segment MN = 7 cm. (iv) Let AM and BN intersect at O. Then ∆ OMN is the required triangle.